Our 2017 Teaching with Technology Survey found that faculty have a positive outlook about technology's impact on their work, teaching effectiveness, student learning and more. 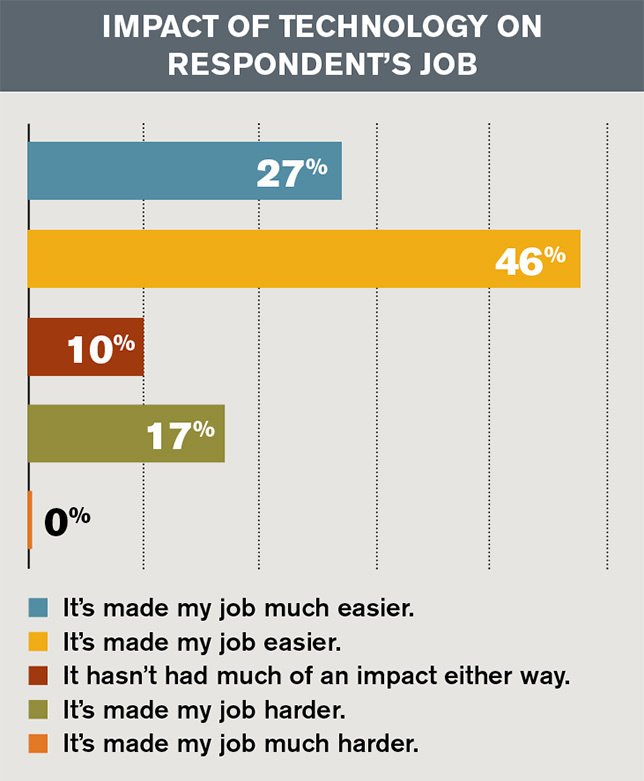 In a survey of faculty members at colleges and universities across the United States, 73 percent of respondents said technology has made their jobs "easier" or "much easier." And nary a one considered their job "much harder" thanks to tech. Those findings came out of Campus Technology's second annual Teaching with Technology Survey, in which we asked faculty to dish on their use of technology, likes and dislikes, views of the future and more. Their responses revealed a lot about the business of teaching and learning with technology today — and how it has changed over the last year. Whether technology is making life hard or easy for faculty, the majority of respondents (85 percent) feel the effort is worthwhile, agreeing that "Technology has positively affected my ability to teach." That number is slightly lower than last year, when 88 percent felt the same. The results were similar when it came to technology's impact on student learning. Eighty-one percent of respondents saw a positive effect, compared to 84 percent last year. And 13 percent feel tech hasn't affected student learning one way or the other. "Technology is only as successful as the teacher who uses it," noted one respondent from a public university in California. Overall, faculty in our survey hold an upbeat view of technology's value in higher education: Eighty percent think tech has had an "extremely positive" or "mostly positive" impact on education, similar to last year's count of 81 percent who felt the same. A handful of respondents were less sanguine, feeling that technology has had a "mostly negative" impact, and 19 percent saw both positive and negative effects. As one faculty member from a two-year institution in Texas asserted, "Technology is rampant, but the actual impact on learning is unknown. Random studies have been conducted, but no one really knows." "In some cases, technology is already overshadowing the learning process and making it more difficult," opined a respondent from Illinois. "More technology is not always the answer and more technology cannot replace good instruction." "As with any facet of teaching and learning, there needs to be enough time for faculty to learn to properly use, adapt and implement for technology to be beneficial," pointed out a respondent from a Florida university. "Technology used badly can be horrible," agreed a faculty member in Georgia. "Technology used to enhance student access to the world and their ability to collaborate and create can be awesome! It all depends on how you use it (like everything else)."